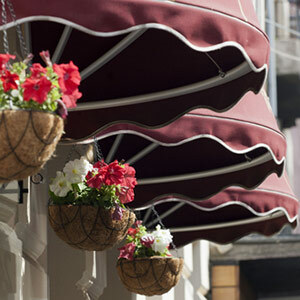 Fabric awnings and canopies can meet various design needs. Our modern fabrics are long-lasting, bright, easily cleaned, strong, and flame-retardant. Modern frame materials offer high strength-to-weight rations and corrosion resistance. The proper combination of these properties result in safe, strong, economical, and attractive products. Aside from the beauty awnings provide, they can be installed above windows to shade the interior and protect your furniture and decor from the sun’s harmful rays. The shade provided by the awning also can cool the temperature of your home. Depending on the type of fabric and style of your awning, your home may be cooled as much as 15 degrees, which in turn will lower your energy costs. Awnings or canopies built off a patio or deck provide a cool and relaxing extension of your living area for you and your guests. You’ll enjoy the comfort of cool shade during the sweltering heat. The canopies also extend your living space, giving you more room to sit back and relax while enjoying the beauty of the outdoors. If you don’t want an awning extending from your home all of the time, you can also enjoy a retractable awning which retracts into it’s special protective housing during the bad weather. Commercial canvas: These highly customizable awnings are available in a variety of styles, sizes and colors to fit your business’s needs, offering options such as acrylic or vinyl, backlit or non-backlit, aluminum or galvanized steel framing, concave or convex shapes and A-frame, bullnose, shed or a combination style. Residential canvas: Our residential canvas options encompass an incredible range of styles, sizes and fabrics to lend your home charm, style and functionality. Aluminum: Our custom-made aluminum awnings are a great choice for customers who want a sturdy shade provider that requires no maintenance and drastically increases your energy savings by blocking out summer heat and drawing in winter sunlight. Retractable: Retractable awnings offer exciting versatility for those who want to take advantage of Maryland’s weather when it’s beautiful and protect themselves when it’s not. With a vast array of fabrics to choose from, widths up to 40 feet and projections up to 13 feet, you’ll have no shortage of options for your convenient retractable awning. Painted: We use the highest quality acrylic paint. This method is only used on Sunbrella and Patio 500 material. Acrylic paint offers a very durable solution – lasting as long as the fabric it is applied on. Any color, including metallics, can be catered for. Pressure-Sensitive Vinyl: A great option for vinyl material such as Veranda and Nite-Lite, pressure-sensitive vinyl, or decals, create vivid graphics at an affordable price. Available in many colors including metallics and translucents. Eradicated Graphics: In this process, we use a special chemical to ‘wash-out’ the color of the material to create backlit-graphics. (This process can only be used on Erada-Lite material.) During the day you have a sharp piece of signage, and at night it transforms into a vivid advertisement for your business. This option creates the most impact and is ideal for businesses that stay open late. Banners: We also offer vinyl and canvas banners, custom made to any size. 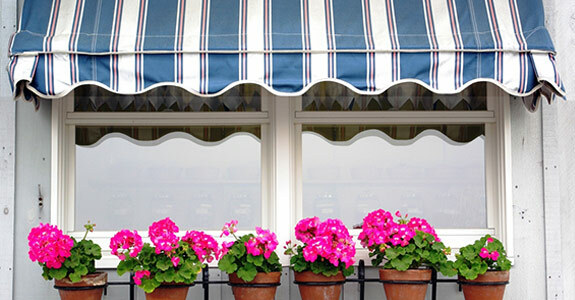 Don’t forget to take proper care of your awnings! For tips on cleaning and care, click here. For tips on stain removal, click here. Check out our Valance Chart here. Whether you want to install a canopy that elegantly reflects the style of your home or you need reliable, careful awning repair in Baltimore, MD, Hawk Awning Company, Inc. will provide you with the customized service you deserve.